Mod The Sims - FEEDBACK - What do you like/hate about the Discussion forums? Technical - FEEDBACK - What do you like/hate about the Discussion forums? Replies: 51 (Who? ), Viewed: 4351 times. #1 12th Feb 2019 at 10:31 AM Last edited by Lyralei : 17th Feb 2019 at 1:15 PM. FEEDBACK - What do you like/hate about the Discussion forums? It’s been a while since the site has seen a look for its time! Back in 2013 we switched from classic to this theme which for 2013 really was something and certainly fit it’s age! However since we’ve been working on a few mockups, I personally as a designer also love outside feedback of what is good about this theme and what is bad/frustrated! If you guys could list some goods and bars about it, it would really help the progress of a new design! #2 13th Feb 2019 at 1:23 AM Last edited by d_dgjdhh : 13th Feb 2019 at 1:49 AM. Wow, I haven't realized it's been that many years since the Classic switch. -- Image resizing that make large images fit the browser. -- The simplified avatar pane, especially the plus symbol to see more information. I would prefer to see the list of games the user has, like in the classic version though. -- The ability for the forum to remove the avatar pane, in case the window is narrow. -- The Agree/Disagree/Like/Helpful/Funny buttons below a post. I feel it should contained be in the post. -- Lack of background design. I think it would be more enticing for the background of the forum to have some sort of image design that's Sims related. Check out my latest version of Superman's Classic Uniform for The Sims 2. See what images I have posted on DeviantArt as well related to The Sims 2 and designs. Also check out My Website to see my superhero uniform creations for The Sims 2. THANKS!!! I'm not sure if you've realised this, but the list of games does not appear on all forums even in classic mode. IIRC it only appears in Game Help in the sidebar. On Bootstrap, the list of games was moved to the top of the original first post. The reason for this is because, to be honest, most of the time it doesn't matter which games a person has installed. Especially in a general discussion or debate room, or even in TS2/3/4 discussion. It only matters when they are asking for help. This is why, even in classic, it never shows up elsewhere. Ohhhh...you're right I haven't realized it. So it is only in the Help forum but not elsewhere. I thought that was supposed to show the games the user has in all forums, but I guess not. There was one fairly recent change to the Download pages which I don't like. Since the "Infobox" sidebar was added at the right hand side, in-line pictures are no longer resized to fit the screen size, as they still are in the ordinary forum, posts. For those of us with small screens this makes some of the newer download pages almost unreadable if creators include very large format pictures (as they are encouraged to do). There may not be many people playing on a monitor with a maximum resolution of 1024x768 as I do, but with, I'm sure, many people viewing the site with tablets and smart-phones, I won't be the only one finding these posts hard to read. All Sims are beautiful -- even the ugly ones. I did decrease the line height slightly, but the font-weight definitely didn't change. Thank you for increasing the line height since my previous post! Posts are more readable again today instead of looking so crammed-together, sigh of relief. A while back KarenLoraine hosted a joint contest for Sims 2 and 3 (Build a Resort). The contest did not show up on the community page - I pointed that out at the time. You had to enter Joint Contests to find it. I think it only affects joint contests - not sure if somebody has fixed that yet. #10 15th Feb 2019 at 6:32 PM Last edited by AGuyCalledPi : 15th Feb 2019 at 6:53 PM. Okay so this is a discussion thread for changes that are yet to be implemented, not changes that have already been implemented? Because unless I'm mistaken nothing (except line height) has changed lately. UX design really isn't my forte but I do notice a few odd things when I start to look for them. Let me criticize some questionable layout design with some absolutely terrible graphic design. Web 2.0 design with loads of hyperlinks and icons is out, getting rid of the excessive functionality and calling it "minimalism" is in. I don't speak for everyone but I for one have never intentionally pressed at least half of the links and buttons on the above page. In fact I only found out just now that the "Gameplay"; "Information"; "General" etc. tags are clickable. And I'm still not sure what the little folder icons mean. or why the "by [USER] [DATE]" text below the topic title isn't italic. Or why stickied threads are not only a different color, but also permanently glued to the top of the page, marked with a "Sticky:" notice, and marked with a little pin icon. I'm never going to open those threads anyway, why use 4 different visual cues to tell me that these threads are stickied? And why is there a big arrow icon next to the username of the last poster of each thread? If I want to visit these people's profiles I'll just click their names. I'd also increase the amount of whitespace on both sides of the page and split each topic into a separate, floating box rather than having them all in a list with a 1px grey line between each one. I also understand that the natural evolution for pages originally designed to be viewed on 4:3 monitors is to be really really wide but it turns out that it's really inefficient to cram information into both ends of the screen when you can keep them closer to the middle just fine. Any information-oriented platform these days has its content in the dead middle with 20-30% margins on either side of the screen. Funnily enough I like my MTS just fine, just like Reddit users liked their mid-00s Reddit just fine. But Reddit realized it was scaring off new visitors and updated their layout, and it really hasn't gotten any worse because of it. The auto picked uploads should be reconfigured -- the most popular & useful content uploaded to the site doesn't reach the old criteria. If the star system doesn't work users who don't look for cc like it's their full time job miss out and it leaves the impression less worthwhile content is being uploaded to the site. Or an entirely new search option that sorted by most thanked, most downloaded, most whatever and allowed you to input a date range would be amazing for downloaders if you wanted to keep the picked & featured content at the staffs discretion. It'd also be nice if you could highlight text to be hyperlinked instead of having to re-type it. I would like it if the list of Followers were sorted alphabetically. #13 16th Feb 2019 at 12:18 AM Last edited by Kestin : 18th Feb 2019 at 1:08 AM. ...I guess "I've been using the classic site since 2013, because I find the current look much less visually pleasing and less conveniently/intuitively organized, and will probably end up no longer using the site if classic mode is ever removed as an option; I would preserve it in a userstyle but I don't know the first thing about programming" isn't the kind of answer the survey is looking for, huh? I wish I could actually put into words the reasons I find the old version so much more usable and clean, because that might be a worthwhile contribution, but on the other hand I'd probably be the only one with my opinions, so it isn't really worth it...other than the fact that I feel it's important to make it known that someone out there feels this way. EDIT: I would repost this in the thread about download pages since that's mostly what I use on the site, but I don't want to be a bother, so: consider this part of that thread and not this one. My pronouns are ze/zir/zirs. I also accept they/them/theirs. #14 16th Feb 2019 at 1:11 AM Last edited by d_dgjdhh : 16th Feb 2019 at 1:41 AM. Yes. Me like. Already looks cleaner, but that (=1 2 3 .... Last Page) quick-select thingmajig definitely shouldn't be dangling off the end of the thread title. I just think that should go in another column over to the right. My thoughts more about organization than anything else. This part is fine, although I'm not sure why the Create a Forum is there. Perhaps it is a placeholder for future categories? Then there is this section. The Latest News section is fine. The announcement thread is also okay. Can the stickies be moved? If so, the Base Game sticky regarding mods could be moved under the Help Section. The Store Freebie sticky could go under WCIF, then there is the Favorite / Least Favorite sticky which a opinion thread. Since doesn't really tie into anything for this section, I guess it could be left where it is. 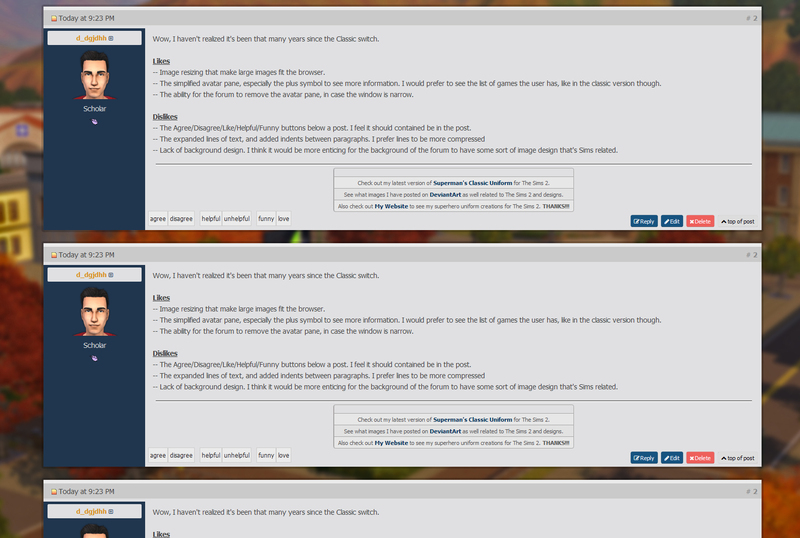 If the stickies can't be moved, then perhaps move the Latest News and Announcement thread to over the Help Forum? This particular section seems to tend to collect random bits of info which is starting to take over. Scrolling isn't a big deal, it just looks messy and possibly overwhelming for those that are new and don't know their way around. It is a lot to look at all at once. As both a user and moderator, I too dislike that Contests and Challenges are split by game. While it makes sense on a theoretical level, I think it would be more helpful to have them all in one forum, with a filtering system (similar to download) so that all contests show in Contests and all challenges in Challenges (eliminating the issue JustPetro pointed out) and can be filtered by game for those who only want them for one. An additional tag could be used for joint contests/challenges so they don't get filtered out if someone selects only one game. I really love the new Upload dropdown. It's much more intuitive compared to the old Create version. First, I want to say thanks to the admins for realizing that this site needs a complete upgraded look. I remember coming back to here a few years ago after a long simming break, and thinking, "Wow, this site looks very old." The downloads page is the highest offender when it comes to this site being clunky. The Featured Uploads section needs to be presented better. I find myself ignoring often because it's smush in between the section tags and latest uploads. It also would be nice if the latest uploads thumbnails were all 225x400. The unevenness of the thumbnails sizes doesn't look too professional. Lastly, looking at the official The Sims website forums as inspiration wouldn't be a bad idea. It's not the most appealing looking forum, but it's clean and easy to detect one thread from another. I agree that there are a lot of buttons that don't get used on the discussion pages and category is definitely one of them. I'm not sure how useful categories are anymore, or even if they are getting used, especially in TS2 forum. 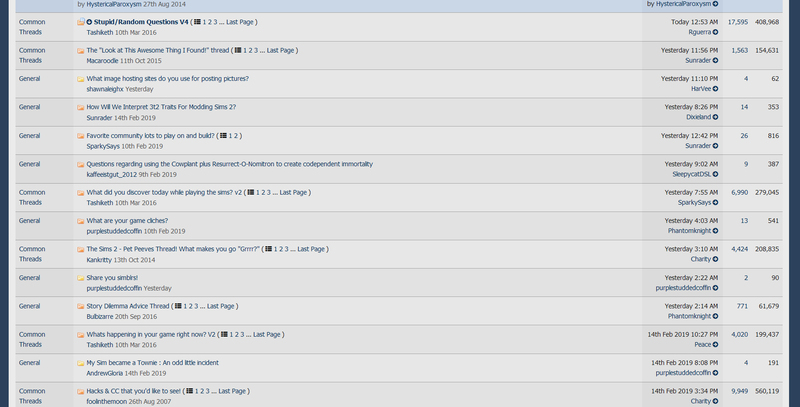 I feel mostly everything goes in General in that forum. But don't take away my arrow button! That "big arrow icon next to the username of the last poster of each thread" takes you to the last post of the thread, not just the last page. I use that all the time. I do think the stickys are too huge, though. They take up so much space and the majority of MTS regulars aren't going to click on them because, at least in the TS2 forum's case, the stickys aren't active threads or threads that will get used all the time, again by regular users. For example, the last EP/SP for TS2 came out in 2008--do we really still need the "The official most favourite/least favourite EP/SP/what one should I buy thread..." as a sticky? Surely most users either have all EPs/the Ultimate Collection, or have chosen deliberately not to complete their collection. Meanwhile threads like the Mini Tutorials thread got buried for a long time before someone was convinced to make it a sticky. It'd be nice if A. Users got to vote & update what's a sticky (like if there was a "please sticky this thread" button users could use and moderators could check/be notified of) and B. If sticky threads only showed one line, the name of the thread, instead of the name and who created it. In fact, I'm not sure we really need to know who started any thread, unless it's in the Help section, tbh. I bring this up because TS2 forum doesn't always have a lot of new topics, but there's a few key threads that always have chatter (Stupid/Random Questions, The "Look at This Awesome Thing I Found!" thread, Hacks & CC that you'd like to see!, The Sims 2 - Pet Peeves Thread! What makes you go "Grrrr? ", and even the Story Dilemma Advice Thread) and it'd be nice if those threads could always be found at the top. I feel like by removing the thread creator line, we could have more stickies without making the first page feel like it's entirely sticky threads. And Justpetro brings up a good point about contests--I've actually completely missed a few, and had no idea they were going on. And I don't think I'm the only one either; if there could be "Latest Contest" announcements below Site News and Site Announcements, that would be helpful. I definitely had trouble finding the thread for the Calendar contest; I had to keep using the link from the site news. Next, when I'm posting on a thread, it'd be nice if the Quick Reply had a Smilies button next to the Post Quick Reply and Go Advanced buttons, so you don't always have to open up the Advanced Reply page if you don't know the code for the smiley you want to use. In that same vein, if it's at all possible to list all of the users who have posted on the page, or maybe the last ten posters or something, below the Quick Reply box, that would also be helpful, so when referring to others, you have the names to copy and paste, right next to where you are writing. I realize that this might be highly specific to me, but I know that when I post and am referring to someone else, I scroll up, find, then copy and paste their name so I'm sure to get it right. Anything that keeps me from having to look all over the place/open new tabs is more helpful to me. Actually, now that I'm thinking it, could we also get rid of the Advanced Reply page all together, and keep everything on one page? Perhaps instead the advanced options could be under drop down buttons/spoilers or tabs? (Sorry, I'm not good with technical terms.) But opening a whole new page to post is only ever really helpful when uploading for a contest, imo, and sometimes, not even then. I can't tell you how many times I've started writing a post but need to look back/refer to what someone said, and have to have a separate page open to do so. It makes things a little clunky. Finally, I may be the only one who wants this, but, just in case, I'd really like a "Preferred Pronoun" line underneath Avatars. I'd like to respect other posters and refer to them properly, but it can be hard to look up--and not because the poster chooses not to identify, but because the information is hidden. I used to be able to find it by clicking on someone's profile, but I can't seem to find that info anymore, not even on my own profile. But I guess I can understand if this isn't something anyone else wants/has an issue with. Actually, classic is not based on bootstrap at all. The bootstrap (current theme) is. When I was working on it, Bootstrap 3 hadn't come out yet, and since they changed a lot between 2 and 3, it would have been a lot of work to do at that time, hence why it was never upgraded. I wont be using Bootstrap at all on the new theme, but Bulma instead, along with jQuery Slim. There are threads that I stickied back when I was moderating, that are still there. I can't do anything about them though! 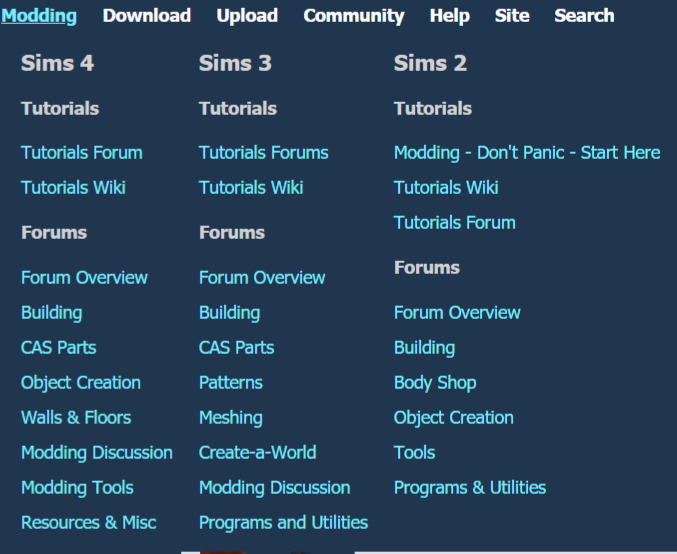 The link to Sims 2 modding discussion isn't in the drop down menu anymore. I used to use that a lot.